In tandem with the 16th Pavilion in 2016, the Serpentine Galleries expanded its internationally acclaimed programme of exhibiting architecture in a built form by commissioning four architects to each design a 25sqm Summer House. The four Summer Houses were inspired by the nearby Queen Caroline’s Temple, a classical style summer house, built in 1734 and a stone’s throw from the Serpentine Gallery. In line with the criteria for the selection of the Pavilion architect, each architect chosen by the Serpentine had yet to build a permanent building in England. The Serpentine Pavilion, designed by Bjarke Ingels Group (BIG), was an ‘unzipped wall’ that was transformed from straight line to three-dimensional space, creating a dramatic structure that by day housed a café and free family activities and by night became a space for the Serpentine’s acclaimed Park Nights programme of performative works by artists, writers and musicians. Kunlé Adeyemi’s Summer House was an inverse replica of Queen Caroline’s Temple - a tribute to its robust form, space and material, recomposed into a new sculptural object. Barkow Leibinger were inspired by another, now extinct, 18th Century pavilion also designed by William Kent, which rotated and offered 360 degree views of the Park. Yona Friedman’s Summer House took the form of a modular structure that could be assembled and disassembled in different formations and built upon the architect’s pioneering project La Ville Spatiale (Spatial City) begun in the late 1950s. 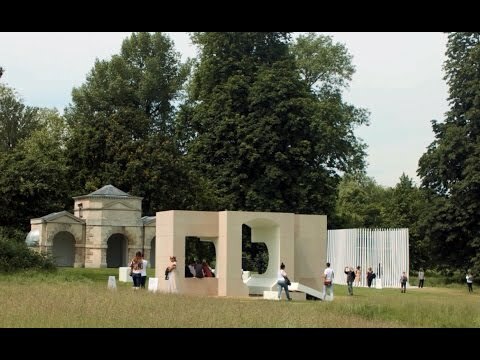 Asif Khan’s design was inspired by the fact that Queen Caroline’s Temple was positioned in a way that would allow it to catch the sunlight from The Serpentine lake. For the Serpentine Pavilion 2016, we have attempted to design a structure that embodies multiple aspects that are often perceived as opposites: a structure that is free-form yet rigorous; modular yet sculptural; both transparent and opaque; both solid box and blob. We decided to work with one of the most basic elements of architecture: the brick wall. Rather than clay bricks or stone blocks, however, the wall is erected from pultruded fibreglass frames stacked on top of each other. The wall is then pulled apart to form a cavity within it, to house the events of the Pavilion’s programme. This unzipping of the wall turns the line into a surface, transforming the wall into a space. A complex three-dimensional environment is created that can be explored and experienced in a variety of ways, inside and outside. At the top, the wall appears like a straight line, while the bottom of it forms a sheltered valley at the entrance of the Pavilion and undulating hillside towards the Park. The unzipped wall creates a cave-like canyon lit through the fibreglass frames and the gaps between the shifted boxes, as well as through the translucent resin of the fiberglass. As a result, the shifting overlaps as well as the movement and presence of people outside create a lively play of light and shadow on the cave walls within. The materials include wooden floors and extruded Fiberline profiles, providing every surface with a warm glow and linear texture – from the mesh of woven glass fibres to the undulating lines of the grain of wood. This simple manipulation of the archetypal space-defining garden wall creates a presence in the Park that changes as you move around it and as you move through it. The North-South elevation of the Pavilion is a perfect rectangle. The East-West elevation is an undulating sculptural silhouette. Towards the East-West, the Pavilion is completely opaque and material. Towards the North-South, it is entirely transparent and practically immaterial. As a result, presence becomes absence, orthogonal becomes curvilinear, structure becomes gesture, and box becomes blob. The Serpentine's Pavilion commission, conceived in 2000 by former Director, Julia Peyton-Jones, has become an international site for architectural experimentation and has presented projects by some of the world's greatest architects. Each Pavilion is sited on the Serpentine Gallery's lawn for four months and the immediacy of the commission – taking a maximum of six months from invitation to completion – provides a unique model worldwide. The selection of the architects, chosen for consistently extending the boundaries of architecture practice, is led by the Serpentine’s core curatorial thinking, introducing contemporary artists and architects to a wider audience. The brief is to design a 300-square-metre Pavilion that can be used as a café by day and a forum for learning, debate and entertainment at night. The Build Your Own Pavilion competition invites young people aged 8 to 14 to submit their Pavilion designs online and at workshops across the UK during the summer of 2016. The Serpentine Pavilion is one of the top-ten most visited architectural and design exhibitions in the world. There is no budget for the project, it is realised through sponsorship, help-in-kind support and the sale of the Pavilion. Artist Anna Lucas created a kit of parts for families to use to explore the 2016 Pavilion, Summer Houses and surrounding landscape. The 2016 Architecture Family Pack: Loose Parts was free for families and available at the Serpentine throughout the summer. Bjarke Ingels (born 1974) is a Danish architect. 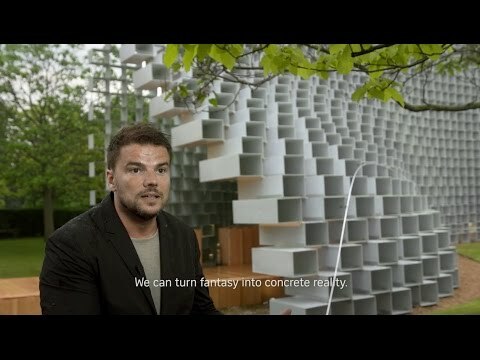 He heads the architectural practice Bjarke Ingels Group (BIG), which he founded in 2005 with offices in Copenhagen and New York. The New York office was established in 2010 after working on projects in North America since 2006. BIG is led by Bjarke Ingels (Founding Partner) with 11 additional partners:. BIG currently employs around 300 architects, designers, builders and thinkers who come from over 25+ countries representing Scandinavia, North America, Latin America, the Far East and Continental Europe. Since 2009, Ingels has won numerous architectural competitions and awards including AIA National Architecture Honor Award (2015); AIA NY Urban Design Merit Award (2015); RIBA Award European National Winner (2014); Architizer A+ Awards (2014); Progressive Architecture Design Award (2013); Nordic Light Award (2013); International Economic Development Council Excellence Award (2012); Crown Prince Culture Prize, Danish Culture Fund (2011); Scandinavian Green Roof Award (2010); Cityscape Dubai Award (2009). Yona Friedman’s Summer House took the form of a modular structure that could be assembled and disassembled in different formations. Asif Khan’s design was inspired by the fact that Queen Caroline’s Temple was positioned in a way that it would allow it to catch the sunlight from The Serpentine lake. Build Your Own Pavilion was a digital platform and nationwide campaign to celebrate architecture and encourage young architects everywhere to design public spaces for the cities of the future.